Imagine trying to teach English grammar to a child before allowing him or her to speak!. That is how most books approach a technical subject but we know better. We know that practical experience makes learning the theory an interesting proposition. The success has been proven with time. We have been selling PIC training courses for 12 years and trading for over 25 years. The P206 PIC training and development course is a modular version of our P931 course. The P206 course is ideal for complete beginners to PIC programming who intend to study PIC programming with a particular project in mind, rather than for general study. The P206 hardware consists of a programmer module with plug on test circuits which when detached become self contained project modules. The P206 course offers exactly the same training as our P931 course except that the third book Experimenting with Serial Communications does not yet have a P206 edition. The first edition of the first book which we published in 2000 was written around the PIC16F84. The book received universal praise from our customers, and the PIC16F84 remained the firm favourite for many years. Finally in 2007 we decided it had come to the end of its usefulness and completely updated the course using the PIC16F627A. Three years later in 2010 technology had again moved up to a new level and we updated again to the eXtremely Low Power PIC16F1827. The course continues to follow the same well proven structure with real books which lie open on your desk while you use your computer to type in the programme and control the hardware. Windows XP, NT, 2000, Vista, 7 and 8 etc. connected directly to any USB port on your PC. and chapter 11 (temperature tests). 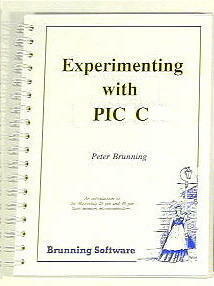 Some of the experiments in "Experimenting with PIC C" require circuits to be built up on a plugboard. The plugboard, programming lead and components for the experiments in chapters 12 and 13 are listed above on the right and are an optional extra. If this optional kit is purchased there is no soldering involved. The links are supplied cut to the correct lengths and the motors are supplied wired with connecting leads. Full point to point wiring instructions are included in the book, and the only tools needed to construct the circuits are a pair of side cutters and a pair of pointed nose pliers. Resistors are individually bagged and the other components are grouped logically so that no previous knowledge of components is needed. As well as learning about PIC programming this is also an excellent way to learn about some complex electronic circuits. Everyone should start programming PICs using assembly language because this is the only way to fully understand what happens, but there is a general misconception that PIC assembly language is difficult. Imagine trying to teach English grammar to a child before allowing him or her to speak yet that is how most books approach a technical subject. Our first book introduces PIC assembly language programming by jumping straight in with four easy experiments. The first is explained over seven and a half pages assuming no starting knowledge of PICs. The programmes are tested using the simulator then written into the test PIC and run in the real world. Then having gained some practical experience we study the basic principles of PIC programming, learn about the 8 bit timer, how to drive the liquid crystal display, create a real time clock, experiment with the watchdog timer, sleep mode, beeps and music, including a rendition of Beethoven's Fur Elise. Then there are two projects to work through, using a PIC as a sinewave generator and investigating the power taken by domestic appliances. The second project requires us to measure voltages and currents. Previously we needed to change to using a more expensive PIC but an analogue to digital converter is one of the extra features contained in the PIC16F1827. Now we are able to continue using the same PIC. Finally we learn how to adapt the experiments right through the book so the software can be run in the PIC16F627A family, PIC16F84 and PIC18F2321 family. In the space of 24 experiments, two projects and 56 exercises the book works through from absolute beginner to experienced engineer level, covering a comprehensive selection of the most up to date microcontrollers. For most of the experiments we use the Brunning Software assembler BSPWA. But in Chapters 3M and 5M we repeat some of the previous experiments using the official Microchip assembler MPASM X. The text used for both assemblers is identical so when we repeat the experiments we simply load in the file we have already created using BSPWA. So we benefit from the simplicity of BSPWA while also learning to use MPASM X. This book is wirobound to open flat, 240mm x 170mm, 320 pages. For most programmes the Brunning Software PIC assembler BSPWA requires no setting up. Start the programme running. Click [Load Template] to create the top six lines. Start typing your programme text. Click [Build] to create the PIC code. Click [Start Simulator] to test the code. Connect the Brunning Software programmer module to your PC and fit a test PIC into one of the ZIF sockets. Click [Write Test PIC] to write the code into the test PIC. Click [Run Test PIC] to start the programme running. For more information about BSPWA 7.1 click here. We start by typing a very simple programme in C which gets the PIC to turn on two LEDs. Then we discover how easy it is to use C to create programme loops, and we experiment with IF statements. We learn how to use C to access the 8 bit and 16 bits timers, we write messages to the LCD, and use the keypad to enter numbers. Then its time for 25 pages of serious study where we read about some of the more complex C techniques. We are not expected to remember this, the idea being to start the process of understanding the deeper aspects of C.
As we work through chapters 9 to 14 we use a PIC to generate a siren sound, create a freezer thaw warning device, and use a thermistor connected to a PIC to measure temperature. We use the PIC as a step up switching regulator, and to control the speed of a DC motor with maximum torque still available. Then we study how to use any PIC to switch 240 volt AC supplies using an optoisolated triac driving a high current triac. We study how to use the PIC's USART. We start our USART experimenting with direct PIC to PIC serial communication. Then we expand this to experiment with PIC to PC communication using the control PIC in its USB to USART mode. For the PC side of these experiments we use a serial coms facility which is built into BSPWA to avoid needing to write a programme for the PC. (When you work through the third book you will learn how to create your own PC programmes). 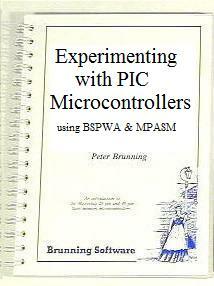 Chapters 15 to 21 have been added with the 4th edition of Experimenting with PIC C published on 1st December 2009. These seven chapters introduce C for 18F PICs. We start with a very simple programme, experiment with the built in timer, write to the LCD and read the keypad. Then we make a direct comparison between 18F assembler and C by experimenting with the complex calculations needed for temperature measurement. We end by using C to write the code for 18F PIC to PC serial communication. This book is wirobound to open flat, 240mm x 170mm, 302 pages. This third stage of our PIC training course is optional. It starts with simple experiments using a PIC18F2321. We use the PIC to flash LEDs and to write text to the LCD. Then we begin our study of PC programming by using Visual C# to create simple self contained PC programmes. When we have a basic understanding of PC programming we experiment with simple PC to PIC serial communication. We use the PC to control how the PIC lights the LEDs then send text messages both ways. We use Visual C# to experiment with using the PC to display sinewaves from simple mathematics. Then we expand our PC and PIC programmes gradually until a full digital storage oscilloscope is created. The final audio oscilloscope has harmonic analysis and sophistcated triggering. For all these experiments we use the P931 programmer as our test bed. When we need the serial link to the PC we flip the red switches to put the control PIC into its USB to USART mode. 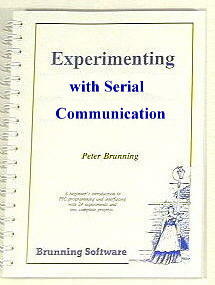 The second half of Experimenting with Serial Communications 4th Edition starts with an introduction to our Easy USB. Then we repeat some of the serial experiments but this time we use a PIC18F2450 with its own USB port which we connect directly to a USB port of your PC. We follow this with essential background study then work through a complete project to use a PIC to measure temperatures, send the raw data to the PC, and use the PC to calculate and display the temperature. Easy USB is a perfect solution for simple and medium complexity project. For complex projects or where the timing is critical it is best to split the action between two or more PICs. 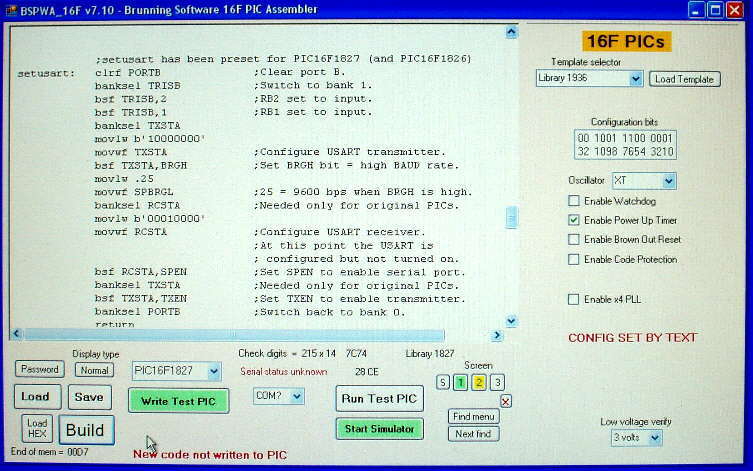 In the last chapter of the book we complete the study by learning how to use the library routines to programme a PIC18F2450 as a USB to USART converter. This book is wirobound to open flat, 240mm x 170mm, 294 pages. 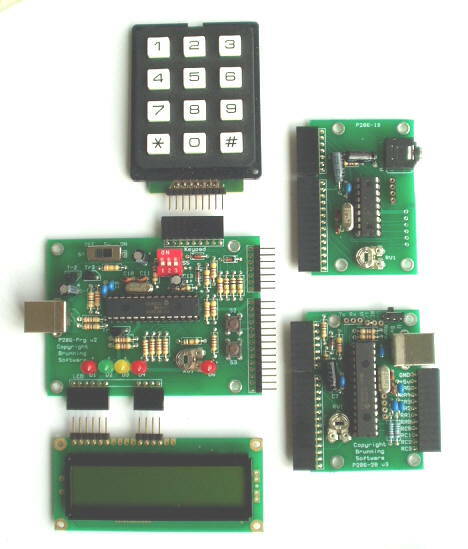 To work through all three books you will need the P206 programmer module with the LCD and keypad plugged in, and you will need the P206-18 test module for 18 pin PICs and the P206-28 test module for 28 pin PICs. The P206-18 is at the top right of the picture. The P206-28 is at the bottom right of the picture. When either of these test modules is plugged onto the programmer module the PIC in the test module is connected to the LCD, keypad, four LEDs and two push buttons which are wired on the programmer PCB. The control PIC on the programmer module uses the LCD to display system messages but when the test PIC is running its code the control PIC disconnects itself from the LCD. The P206-18 will be supplied with a PIC16F1827 fitted, and the P206-28 will be supplied with a PIC18F2321 fitted unless a different PIC is requested. When you are ready to experiment with your own ideas you can use either the P206-18 or P206-28 as your project module. The P206-18 is perfect for simple projects but for complex projects the P206-28 is needed. When the test module is detached from the programmer the 5 volt power needs to be supplied directly to the test module. 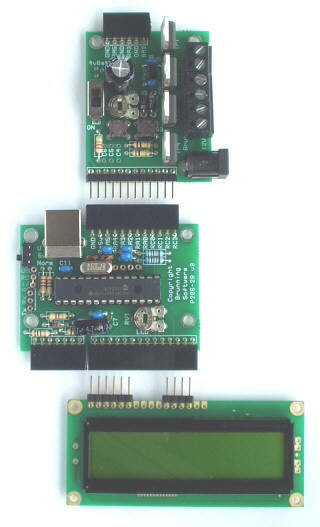 This picture shows the P206-28 (in the middle) with the PIC206-IO (input/output) module above and the LCD below. The LCD which is usually plugged into the programmer module can be plugged directly into either test module. The P206-28 has the advantage of being able to use the P206-IO which provides the P206-28 with a 5 volt supply, four high current open drain outputs and two push buttons. The P206-IO has a 12 volt DC input socket which provides power for the high current circuits and power for the onboard 5 volt regulator.